I found the cure for my flat, lifeless hair. It wasn't a "magical" hair pill, it wasn't another sticky gel or mousse product, it wasn't a teasing brush...it was called VOLOOM. And it was nothing I had ever seen, heard of or even dreamed of before. July this year I was speaking at BlogHer, my second time speaking at this annual women's blogging and marketing conference. The first time was when I was just 16--my very first speaking gig. It was a great conference, my session went well, I met some wonderful people...but one of the most memorable experiences I had took place in the Expo Hall. I found the cure for my flat, lifeless hair. It wasn't a "magical" hair pill, it wasn't another sticky gel or mousse product, it wasn't a teasing brush...it was called VOLOOM. And it was nothing I had ever seen, heard of or even dreamed of before. And I just had to share this lifesaving invention with my readers. If you have hopeless hair like I do--lifeless, super fine hair that lies flat on your scalp--then you're probably getting excited. And trust me, VOLOOM is something to get excited about, for anyone who wishes they could easily add more volume to their hair. It's a brand new invention, so new that its official launch was only just over a month ago. They were at BlogHer with demos to start getting the word out about their new product, and whether it was chance or fate, I happened to walk by the VOLOOM booth...and what happened next amazed me. A woman holding an oddly-shaped hair iron was standing over another woman while she sat on a chair. The iron looked like a flat iron but instead of having flat plates it had checkerboard-like indentations, which she was applying to the roots of the under-layers of the woman's hair. When she was finished, the woman had undergone an eye-popping, voluminous transformation. I couldn't believe it. And I could not wait to be next. When it was my turn, I sat down and learned the woman with the VOLOOM iron was called Patty, who I later found out was the inventor and founder of VOLOOM. After she was done with my hair, I was given a hand mirror to see the results. What I saw was better than I'd ever imagined. My lifelong dreary hairstyle which usually resembled a drowned cat was now a full and gorgeous head of hair with actual life and bounce! I was in love. By now you're probably wondering how exactly the VOLOOM iron works. Let me explain; the iron has two beveled waffle plates that interlace as they are clamped onto the hair while heated to a temperature of up to 390 degrees, depending on your hair type. VOLOOM is only applied to the under-layers of the hair, and only at the roots and optionally a couple of inches down the hair shaft. You may think this sounds like the iron is crimping the hair to give it the volume, but this iron is totally different than a crimper. 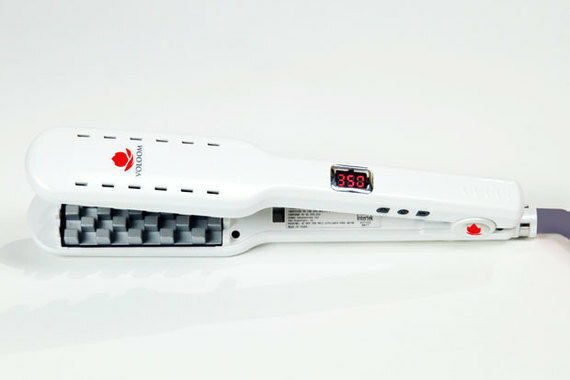 A crimper leaves a defined pattern in the hair which VOLOOM does not after the hair cools, and the tool does not bend the hair at extremely sharp angles like a crimper does. It's much better for your hair than a crimper, or a flat iron or curler. This is mostly because you don't use VOLOOM on the ends of your hair which are the most damage-prone, but only on the roots where your hair is rich in natural oils which act as a heat protectant. Also, you apply the iron for only a second or two to each section of hair. VOLOOM has protective ceramic-coated plates and ionic technology which helps seal the cuticle and protect your hair from damage. And an extra plus on top of that is the fact you don't need to shampoo your hair as much while using VOLOOM, because the iron gives your hair enough lift and bounce without the need for over-washing or over-styling. Much of this information I learned directly from Patty, who also filled me in on how she came up with the idea of VOLOOM and the process of bringing this tool to life. Patty quotes, "As I got older, I began to notice that my hair was getting finer and thinner and I just couldn't do anything with it. I like to wear it long, shoulder length, but thought I would have to cut it because it was looking so thin and weak. I spoke with many friends who complained about the same problem. I knew that mousses and sprays gave me a little more volume, but not enough to really notice. And teasing leaves a matted mess. So I decided that a new kind of styling tool needed to be invented that would put some "structure" into the lower layers of the hair and hold up the top layers. But this structure, or texture, needed to be very subtle and not leave a defined pattern in the hair like a crimper does. I developed many prototypes over a three year period...of prototyping and perfecting the plates and then patenting them...and the result was VOLOOM." I've been using my own personal VOLOOM iron for a couple weeks now, and every time I use it I fall more in love with it. I had tried every supposed "quick-fix" for flat hair and every volumizing gimmick out there, and nothing had worked for me like VOLOOM does. I have thin, fine hair and I use the iron at a temperature of 345 degrees and it works just great. The iron heats up in a matter of seconds, and takes me only a few minutes to use. And when I wake up the next morning, my hair is still voluminous! I used to get frustrated with my hair all the time, and now I'm totally content with what I have. As Patty says, you can finally quit worrying about your hair and get on your life! Patty quotes, "I've used it on hundreds of people, and almost everyone has seen a huge difference. Even women who thought their hair was hopeless, like I did...So quit worrying about your hair, and get on with your life! That's my advice. " If you'd like to learn more about VOLOOM, be sure to check out their website as well as their Facebook page where they'll be posting giveaways and other promotions in the near future. You can also follow their Youtube channel which has an array of beauty tutorial videos, before and after videos, etc.